What will my proposal planner do for me? Whether you’re hosting a birthday party, baby shower, or simply celebrating life, we approach each event as a blank palette, infusing it with the perfect mix of designer details. The invitations, cocktails, music, flowers and the menu are just the beginning! 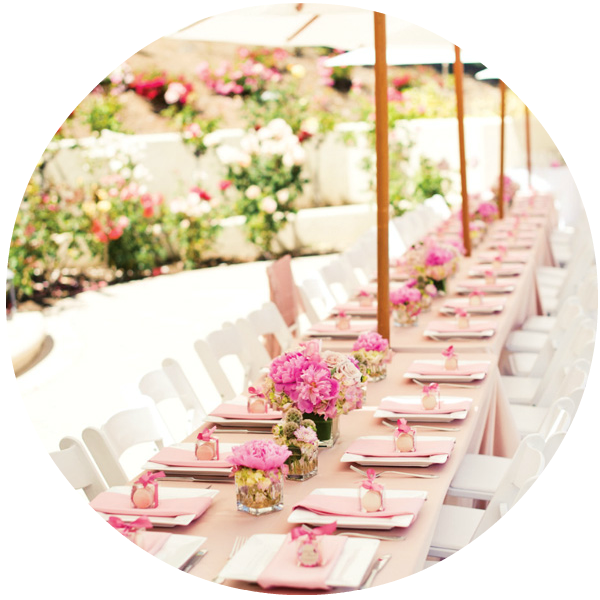 Your guests will have so much fun; they’ll be asking when you plan to throw your next shindig! Engagement is such an exciting time! What better way to celebrate than with an intimate affair between you, your fiancé, and those who mean the most! Whether you desire a garden gathering, rooftop cocktail party, pub & pretzel drop in, or however you wish to celebrate; we'll create a personal & memorable experience fit for this special time! Here's to the two of you, CHEERS! For more information on engagement parties and celebrations, contact us for our BUBBLY brochure. Pricing is customized on an individual event basis. A green event is not limited to recycling alone; we go beyond that by taking a whole systems approach to the resources and waste that can be generated in organizing an event, considering sustainability at all stages of the planning process. Our approach aims to first reduce the total amount of resources being used including material and energy resources, then encourages the reuse of resources , and lastly make sure that materials are disposed of responsibly. For more information on green wedding & party planning, please contact us for our LUSH brochure. Pricing is customized on an individual event basis. Whether you desire a registry full or your hearts desires or monetary gifts for a new home or honeymoon, we'll provide you with unique resources to make sure you get what you need most. Then we'll coordinate a personalized get together along side your friendly host. Guests will be counting the days until your wedding! For more information on bridal/couples showers & events, contact us for our SOCIAL brochure. Pricing is customized on an individual event basis. There's no better time for your wedding party to bond before the big day than this infamous night. The celebratory possibilities are endless! We'll assist your squad in all the necessary preparation and help coordinate a party or weekend away that reflects you and your interests! We'll help to maximize your budget and negotiate mini excursions & experiences. For more information on bachelor/bachelorette parties & getaways, contact us for our ENTOURAGE brochure. Pricing is customized on an individual event basis. Candles, confetti and garland, OH MY! Who doesn't love a good party? Whether your starting a holiday tradition amongst friends or celebrating a milestone with the ones you love, we'll help you organize an unforgettable gathering worthy of your extra special occasion! For more information on birthday, anniversary & holiday celebrations, contact us for our CONFETTI brochure. Pricing is customized on an individual event basis. ALL OF YOUR EVENTS ARE MEANT TO BE CELEBRATED IN STYLE. BRIDES AND GROOMS, EVENT PACKAGES SELECTED IN COMBINATION WITH A WEDDING COLLECTION SERVICE ARE CONSIDERED A DESIGNER ADD ON AT OUR EXCLUSIVE BRIDAL RATE!